When you are facing divorce, it’s important to know all the components that make up your marital assets. Especially if the assets include some form of executive compensation. Several of these items provide income and can be difficult to value—or even understand! Let me walk you through a primer and try to take out some of the mystery. Restricted stock is now the most commonly used form of executive compensation. This is shares of company stock given to an employee as either compensation for past performance or an incentive for future performance. It’s critical to get the actual grant documents to know which the case is. It makes a big difference when determining how many of the shares are Marital Property. They can be in two forms, either actual shares of stock (RSAs), or a right to acquire shares at vesting (RSUs). Again, the marital portion can be quite complex to calculate, but critical that you have it done. This is another job for that CDFA® (Certified Divorce Financial Analyst) or other specialist. This is a benefit wherein the employee is allowed to buy company stock at some regular frequency, usually at a price that is discounted from the current market price. When the shares are purchased, they can be sold immediately or held at least a year for more favorable tax treatment. With this option, the employee can choose to defer some portion of current compensation until a future date. These deferrals may be salary, bonus, or even equity compensation. Sometimes the employer will also match these deferrals. They are totally discretionary so any spousal maintenance should be based on total compensation before any deferrals. Also, any balances in the plan are likely marital property as well and should be analyzed carefully. 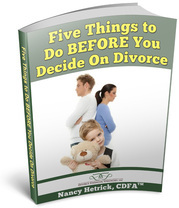 Do yourself a favor and bring in a CDFA® as early as possible, preferably before the discovery phase. The CDFA® will be able to provide you with a list of exactly what documents will be necessary to properly value the assets and determine marital property vs. separate property. This will prevent any last minute scrambling if you end up at trial. Most CDFAs® are qualified to do this but not all. Be sure to find one versed in executive compensation who feels comfortable with the task. It will also help if the CDFA® is available for any depositions so that he or she can be qualified as an expert early and preview for the other party the quality of financial information that you’re having prepared. Sometimes this is just what it takes to encourage a settlement! The CDFA® can also help ensure that the final Settlement Agreement is written to properly reflect the way the compensation will be handled. Executive compensation accounts are not usually eligible to be given to a non-employee spouse at the time of divorce so the employee spouse must have very specific instructions on what must happen to specific shares, options and grants upon vesting that takes into account the taxation responsibilities, etc. Executive compensation can be very complicated and if you take it on yourself, you’re exposing yourself to a lot of risk. These assets are often substantial pieces of the marital pie and it is critical that they are valued correctly so that you can negotiate your settlement confident that you are really receiving what you’re entitled to. This is one area you don’t want to scrimp on. This expert on your team could single-handedly get you thousands of dollars more in settlement by ensuring that EVERYONE has all of the correct information.